and German components. They import the Heroal pre-coloured roll-formed slat of the very highest quality from Germany, along with guides, box housings and motors. The Heroal slat is the strongest and most durable in the industry with a 10 year colour fast guarantee. The interlocking slats with rigid foam fill offer sound and thermal insulation. Aluroll make and deliver nearly all orders in under 2 weeks. All doors are made-to-measure, fully automatic and have a full box enclosure at no extra cost. Available in numerous colours and woodgrain finishes. The Aluroll Elite Garage Door has achieved certification by the Loss Prevention and Certification Board (LPCB). This gives police approval “Secure by Design”. A very secure garage door, at little extra cost. 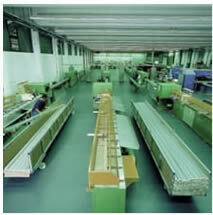 Aluroll and their parent company, Roché Systems, were one of the first U.K. manufacturers of the European Roller Shutter System. 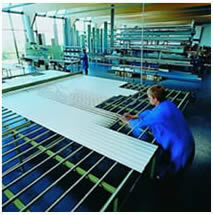 They manufacture security shutters and grilles, as well as garage doors. An ISO 9001 company, based in Shropshire, it is a privately owned family business. Excellent pre and after sales service. Regular delivery runs to all parts of the U.K. Arridge Garage Doors are Aluroll’s main internet supplier, offering well over 40% discount and free delivery. The features listed below are standard for the Aluroll roller garage door. Other manufacturers offer most of these features as an option at extra cost. Auto reverse safety system. The Somfy wireless optical bottom edge obstacle detection system built into the door ensures safe usage, peace of mind and full CE compliance. The Aluroll Classic 77mm x 17mm foam-filled slat is by far the most popular door. However, the Aluroll Compact 55mm x 7mm foam-filled slat version is ideal on garages with limited headroom, as the box is only 205mm square. The Classic door has a 300mm square box, unless the door is over 3 metres high, when the box size goes up to 360mm square. Not all of the box has to fit behind the lintel. The neat powdercoated aluminium box front can partially or fully show (when viewed from the front). It acts as a neat facia. Not all manufacturers include this. Aluroll includes a full box enclosure on all their Classic and Compact doors. Aluroll are also one of Britain 's leading security shutter manufacturers. Aluroll security shutter fitted on a balcony offers security, sun shading and privacy. Steelroll are a newly opened subsidiary / sister company to Aluroll. They manufacture galvanized steel shutters, grilles, car park shutters and industrial roller doors.